Doctors often advise pregnant women to avoid certain cheeses to reduce their risk of listeria, which is a foodborne illness that can cause miscarriage, stillbirth or premature delivery. If you are pregnant, it is best to avoid eating soft cheeses made from unpasteurized milk. These include Camembert, Brie, feta, cheese with blue veins, queso blanco, panela and queso fresco. Processed cheeses, however, such as Velveeta, are okay to eat during pregnancy, but they aren't the healthiest choices. Calcium is one of the nutrients that pregnant women need to pay particular attention to, because it's necessary for babies' proper development in utero. Although cheese can be one way to get enough calcium in your diet, Velveeta probably isn't the healthiest choice overall. 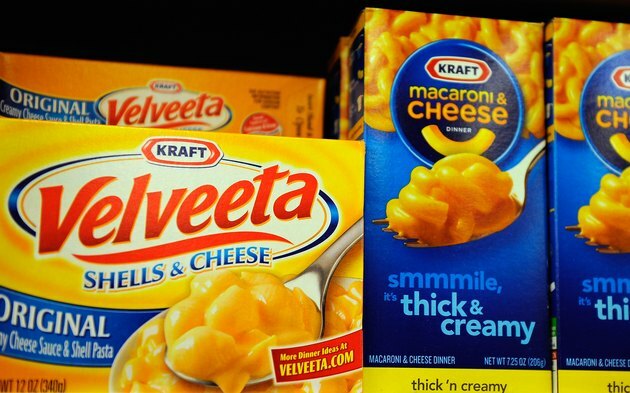 One ounce of Velveeta contains 6.2 grams of fat -- including 4 grams of unhealthy saturated fat, or 20 percent of the daily value -- as well as 420 milligrams of sodium, or 18 percent of the DV. Eating a 1/2-cup serving of nonfat cottage cheese can help you get the calcium you need without a lot of fat. Reduced-fat mozzarella is another choice that has less fat than Velveeta and less sodium than Velveeta or cottage cheese.